Following is a very simple but very effective mantra of Ramdut Hanuman for fulfilling all kind of tasks. Like in my previous posts, this Hanuman Mantra too doesn't need Guru Diksha. 1. First and foremost is it is a very powerful Mantra for Sade Sati. The Mantra has to be chanted 40 rosaries daily for 108 days. The Mantra as I previously mentioned is very very powerful Healing Mantra. By healing I mean not only for the health factor but it also heals the various problems one is facing, especially Shani Sade Sati or Shani Mahadasha of 19 years. Do not get disheartened by the number of days. It is said that when a Mantra makes you feel happy that's when you know its truth. That is the same reason why the Iskcon believers never get tired of chanting the Hare Rama Mantra. Similarly, This Mantra too will create happiness and positivity both inwardly and outwardly and give you immense bliss. 2. Those people who want to get success in a long time pending work should recite this Mantra 11,21 for 31 rosaries or till one doesn't get success in the desired work. 3. For Grihast people who want family happiness, facing problems of family fights, bad behavior of children or parents, lack of happiness, feeling unsatisfied with the family standard of living,etc. should recite this Mantra for 101 rosaries daily for 108 days. Try this Sadhana once and you'll see magic happen. After Siddhi, give Dahsansh Havan, Tarpan, Marjan and Brahaman Bhojan. Do Dashanash Havan with sesame. 4. The people who are facing enemy problems should light an Akhand Diya and chant this Mantra 21000 times within 3 days. 5. For getting rid of diseases recite this Mantra 1000 times or for 10 rosaries daily till you get rid of the diseases. You can increase the number of chants if the disease is severe. 6. For Hanuman Darshan Praapti, recite this Mantra 7 lac times within 31 days. 7. For attracting wealth, Lakshmi and the 16 Aishwaryas or for fulfilling any such Shanti Karma kind of wishes, recite this Mantra 1 lac times with 21 days. Do Dashansh Havan with sesame. 8. For getting out of prison, recite this Mantra for 41 rosaries daily for 31 days and the desired person will be freed from prison. One must promise Hanuman that if the person gets freedom he/she or you will do Bhakti of Hanuman daily in some or the other way and never do Paap Karma again. 9. For getting spiritual upliftment, recite 31 rosaries of this Mantra for 1 year. 10. For wealth and family happiness related Sadhanas sit on red velvet Aasan facing west and do Sadhana in the evening. For other Sadhanas sit facing north on a Kush Aasan and do the Sadhana in the morning. For spiritual upliftment Sadhana sit facing east and use Kush Aasan. For Shatru Naash or enemy removal Sadhana and spiritual upliftment, use a Red Chandan Rosary. For wealth, wish fulfillment and prosperity Sadhanas use Red Coral Rosary. For Graha Shanti and all other Sadhanas use Rudraksh Rosary. For Graha shanti and spiritual upliftmentment, meditate on the form of a Meditating Hanuman. For other Sadhanas, meditate on a left facing Hanuman idol. 11. For Vaak Siddhi, chant the Mantra facing east for 108 rosaries daily for 108 days. 12. 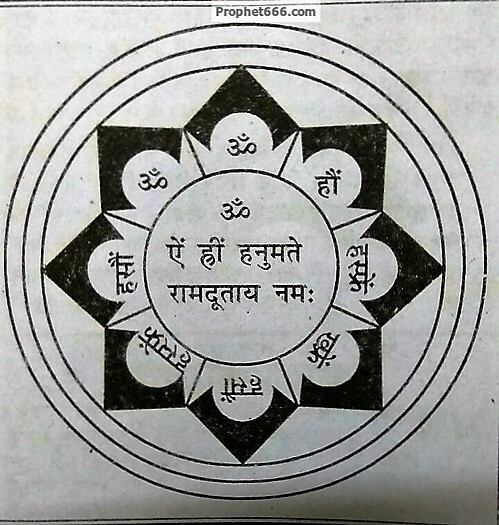 If one writes this Mantra on the tongue of a 5 or 7 month old male child using Chandan mixed with honey with a wooden stick, your the child will become very very intelligent, powerful, become a divine person; get the grace of Hanuman and Shri Rama for its whole life and become a very big devotee of Shri Rama and Hanuman, get unbelievable success in life; and then what is there in all the 3 worlds that my dear Lord Hanuman and Shri Rama cannot give? One must try to write the entire Mantra but if you are unable to write entire Mantra then remove "Hanumate" and write the rest part of the Mantra. 14. For increasing devotion towards Hanuman: chant 5 Rosaries of this Mantra for 40 days. use a red sandalwood rosary only for this purpose and while chanting meditate on the form of Hanuman I have attached. Indeed the mantra is very powerful and one of the most dearest Mantras for me. If the Mantra is written on a Bhojpatra with Kesar and worshiped as a Tantra daily by all the family members together, it will bring the a phenomenal revolution and change in their lives. One must frame the Yantra and do its Pran Prathishtha and Shodashopchar Puja as well. It is my guarantee that this Mantra will work and definitely work and there is absolutely no doubt in it. This Mantra can be chanted by anyone including your children. If you make a Yantra and worship it daily with your whole family, even better. As I don't have the Viniyog for this Mantra, one must recite Hanuman kavach before reciting this Mantra. Other than this, basic Puja rules like light sesame oil diya, incense sticks, Ganesh Puja, Sihv Puja, etc have to be performed. Do not break Brahmacharya. Do not eat spicy foods. Have dinner before sunset. Do not:- lie, speak bad words, get angry, engage in sexual thoughts or activity, speaking too much or speaking unnecessarily. May Shri Rama and Hanuman always help all readers and keep his grace. 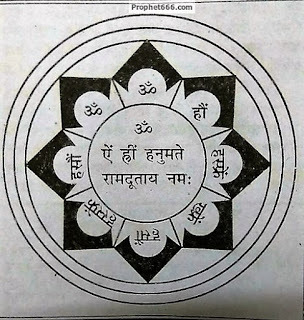 This is the Yantra which has to be kept in home temple as a part of this Mantra Sadhana. One can get a printout or draw this himself. Pls tell us how to use this mantra for getting great physical strength and courage?pls tell us how many times to chant this mantra for physical strength? I vouch for this Mantra.. Though I haven't done a Sadhana on this but it has given me immense help at times of Crisis !! you have mentioned that this mantra is most useful for health.But can it also be used for getting great physical strength?How many times must the mantra be chanted for this purpose?Pls guide. yes sir.but how many times? sorry for bothering you again sir,but I dunno how to chant this mahamantra for physical strength?do I have to do 108 times or 1008 times for physical strength onlyusing rudraksha mala?pls reply. Thank you so much sir.will do as you say. Sir,there's one little problem.In your post you mentioned abt writing the mantra on the tongue of a 5-7 month old baby.when I first read the post as 5-7 year old child.5-7 year old child would mean that the child is still in the womb.Pls clear this doubt in my mind.readers also may find it confusing. Ashok sir, i suffer from social anxiety and lack of courage and as a result of this, my life has become a hell now.I get degraded myself everyday before someone or the other. The thing that haunts me more is the fact that i was not suffering from this lack of courage some years before.All this problem has started from 4 years due to psychological torture from some of my collegues and it has left a huge scar in my mind and as a result i lack selfworth and confidence even to talk to strangers. no remedies can help me out. i beleive that hanumanji can only help me out of this issue that haunts me day and night. Ashok ji , please give me a hanuman mantra that can solve this issue. i would be greatly thankfull if you help me. dear sir please clarify point 13.
thank u also for ur efforts. Thankyou for sharing such a beautiful mantra. We all know the value of brahmacharya for a sadhak. But also we know that in todays world we are surrounded by numerous provocative things,its next to impossible to avoid them. So,its my request that if possible please share any mantra sadhana which may help us to attain akhand brahmacharya,as long as we like,so that we can complete sadhanas without any guilt feeling. 8. You can google "meditating hanuman". You will know. Great help Ashokji, thank you! Jai Shree Ram, Jai Veer Hanuman! Guruji My grandson is 21 months old can I do Mantra lekhan Praying. Keep a big proper temple in your house and establish maha mrityunjay yantra, Rama yantra, shree yantra, ganesh yantra, Hanuman yantra, Kubera yantra in the house. Make sure they are consecrated. These 6 yantras and worship of these gods should be done by everyone. You must do their aarti with family two times a day. This alone will ease out your problems. 1. Recite Sankat nashak ganesh stotra 11 times. 4. Shree sukt and lakshmi sukt 3-3 times followed by 1 rosary of Mahalakshmi, Narayan and Rama gayatri mantra. All of the above will take not more than 45 minutes but you will start seeing results within 2 weeks. While doing the paath, do the sadhana as paying respects. Namashkar guru Ji for yours suggestions and I definitely follow all this as you mentioned thank-you so much. pranam ashok sir...sir am facing..problems im my carrer..not getting gov jobs..though i prepare alot with hardwork...nd some money problems goes on ..plzzz specificy me some guidance as u guided on above query....am a libran..
Chant श्री रामदूतं शरणं प्रपद्ये 3 rosary daily. You will start seeing results within 5 days. Along with it also recite Hanuman dvadash naam stotra 1 mala in afternoon only. Use only red coral rosary for japa. Ashokji. Thanks for your feedback. I wish to know for point no. 4. Of akhand deep for 3 days. Should it be lit for 3 consecutive days. Even my wife wants to do this remedy. Should we have separate akhand deep or same is fine. When is auspicious day to start. jai sri ram. Namaste guru ji , need your help in sving one of my problems . my family given money to another family but they are not returning back it's almost 8 yrs whenever we ask they say yes but not given a single penny. Please help us by suggesting any Hanuman mantra and sadhana. There is just one type of yantra for each of the gods. For procedure on energising , you can look for it on the net. ashok sir, in some of your posts, i have seen the pronounciation of bijakshras given by you as shrin ,hrin and (word ending on 'n') so on.. but in this post, the pronounciation of hreem if not given as hrin but it is given as hreem it self. can you please tell me how these bijaksharas are pronounced correctly? I want to know that you have written write this manra in bhojpatra with kesar can we use asthgandha instead of kesar ? Thanks for your reply sir. Need one last clarification do I have to perform no2 sadhana in which u mention long time pending work should recite this mantra for 21,31 times. Namaste Ashok sir ,can u please tell me the procedure using the above mantra to get Hanuman darshan in dream or to get answer in dream,because I'm having a query which can only and only be answered by him!!!! 1. can I do it in afternoon because I don't get time in morning and evening? You can do un morning, dusk or night only. Nameste, Can women try this. My friend has given money to someone who promised a job and not willing to return it now. And shes paying interest to bank unnecessarily. He's not even responding now. Thank you. Will this mantra help to get back the money from someone whos taken it or not willing to give. with "hiim" and "shrii", Please help, what is which one is correctly? There is no difference, it amounts to the same mantra and same pronunciation. Hello Neel sir. I want to follow this mantra. But u said one must recite the hanuman kavach before reciting it. Can i recite only Ramdut-hanuman mantra. Without reciting Hanuman Kavach. please help me. Hello neel sir. I want to recite this Ramdut hanuman matra. But you said one must recite hanuman kavach before reciting this mantra. But i want this recite this ramdut mantra without reciting hanuman kavach. can i do it. please tell me sir. आवश्यक है .ऐसे मे सफलता कैसे मिल पाएगी ? i have sent you an email from my gmail id.it would be a great favour if you could advise me on my query,as i am eagerly looking forward to your guidance. In the opening para, it is mentioned that deeksha is not needed, you can chant the mantra 108 times daily using a rudraksha mala.